DIVING INDUSTRY ALERT - YOUR ACTION IS NEEDED! Many have seen a disturbing video recently posted on YouTube by Florida fishermen showing a live shark, tied by the tail and being dragged at a high rate of speed behind a boat, resulting in the shark's death. The video was picked up and posted online by USA Today. This photo shows the shark's remains following this cruel act. This is a cruel treatment of any animal, and members of the diving community are appalled by such behavior by members of the fishing public, who must be licensed to fish in Florida waters by Florida's Fish and Wildlife Commission. As an apex predator, sharks are necessary to maintaining the health of Florida reefs. Divers are excited to encounter living sharks and many seek opportunities to dive and observe these creatures. Doing so has been shown to engender the need to protect them, especially from shark finning (killing the shark by removing its fins and dumping it back in the ocean alive), but also from cruelty of the kind depicted in this video. 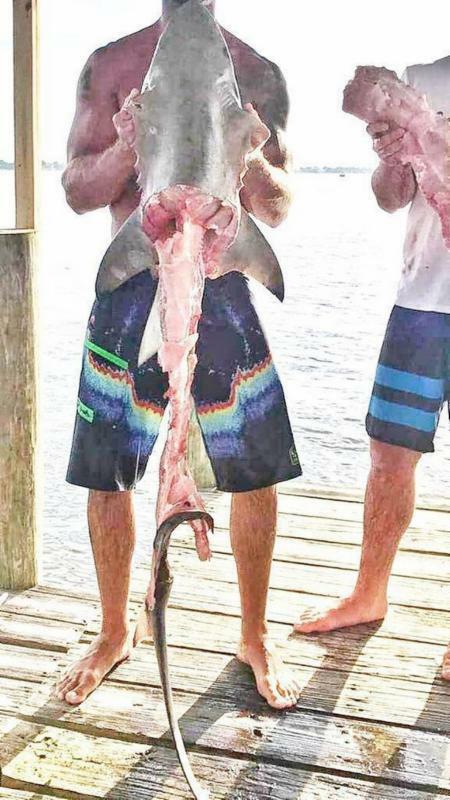 While fishing for most species of sharks is not prohibited in Florida, treating any animal in the manner depicted in the online video is unsettling and could be illegal. The video has rightfully generated a backlash against these persons, but more is needed. According to the Pensacola News Journal, Governor Rick Scott of Florida has correctly called for state wildlife officials to review regulations after seeing this "hateful act" in which the shark is dragged at high speeds through Florida waters. A photo of the shark's remains following this cruel act is shown here. e are enraged by the behavior of several fishers who caught and brutalized a shark by towing it at a high rate of speed behind their boat. We request that you do everything within the limits of the law to prohibit this kind of behavior in the future, including punishing these specific individuals by suspending their Florida fishing privileges.